Also known as “mermaid tears”, tiny plastic pellets are a primary source of microplastic pollution, but the European Commission can stop them from poisoning our seas. Magical and mysterious creatures of the ocean, mermaids are celebrated by enthusiasts on International Mermaid Day on the 29th of March. 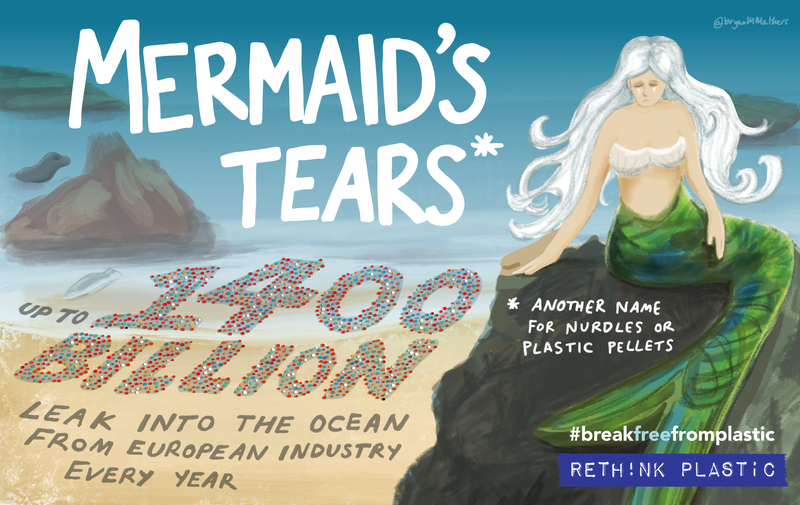 Unfortunately, there’s nothing magical about mermaid tears – another name for the tiny plastic pellets or “nurdles” that come in an array of colours and have been found polluting marine environments all around the world. Every day, billions of these tiny plastic pellets are melted down and used to manufacture plastic products. They escape into waterways when spills occur, which happens at all stages along the supply chain during production, transport or conversion. Less conspicuous than plastic bags, mermaid tears have slipped under the radar of growing public concern about marine plastic pollution – despite being the second largest source of microplastic marine pollution in Europe. According to a recent analysis, up to 167,431 tonnes of these pellets may be entering the ocean from European industries each year. There are also high-impact accidents, such as in 2017 when 2,000km of South Africa’s coastline was coated with pellets following the collision of two vessels. 49 tonnes of pellets ended up in the sea, an eye-watering 3.4 billion individual pieces. Once the pellets escape into the marine environment, their small size makes them impossible to clean up. They act like magnets for dangerous chemicals and toxins, which are then likely to transfer into the food chain if consumed by marine life. 180 marine species have been found to ingest the pellets, which are easily mistaken for food. They can cause internal harm and impair an animal’s ability to breath, swallow, and digest food; risking malnutrition and starvation. Most recently, scientists have demonstrated that dangerous pathogens can “hitchhike” on mermaids tears, travelling vast distances across the ocean. To stop these dangerous pellets from entering the ocean, all companies involved in making, using or transporting them need to commit to robust measures to prevent pellet loss through all stages of the supply chain. Operation Clean Sweep is an industry-led voluntary scheme which provides a toolkit of best practices to stop spillages. However, the scheme lacks monitoring and enforcement mechanisms, and its voluntary nature means that most companies currently do not have any measures in place at all. A tough legislative approach is therefore required that mandates best practice along the plastic supply chain, with transparent monitoring and enforcement to ensure implementation. Companies must be able to provide evidence that everything possible has been done to prevent spillages in the handling of pellets at each stage of production, right through to when the finished product lands on the retailer’s shelf. In 2018, the European Commission committed to put in place measures to reduce plastic pellet losses through the Plastic Strategy, considering options including a certification scheme along the plastic supply chain and/or developing a Best Available Techniques reference document under the Industrial Emissions Directive. Following in-depth review, the option to adopt a certification scheme along the plastic supply chain — referred to as the supply-chain approach — proved far superior in terms of environmental performance and cost effectiveness. The Rethink Plastic alliance is urging the upcoming Commission to fulfill this commitment to address this major source of marine microplastic pollution by submitting a legislative proposal to the European Parliament and the Council early in its tenure. The world is finally waking up to the scale of the problem, with global governments recently being invited to prevent losses of pellets into the environment across the supply chain in a resolution adopted earlier this month at the United Nations Environment Assembly. Recent meetings under the Convention for the Protection of the Marine Environment of the North-East Atlantic (or OSPAR Convention) have taken us another step closer towards applying a supply-chain approach. What is needed now is global leadership from the European Commission, setting the level of ambition high with a legislative proposal to mandate a supply-chain approach to prevent any more mermaid tears from poisoning the sea.